This is a pretty solid release. 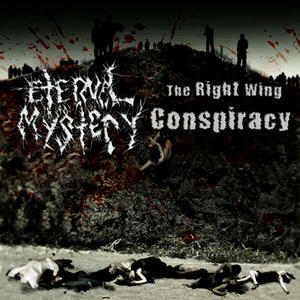 The first 10 tracks are done by The Right Wing Conspiracy. RxWxCx is an industrial grindcore with some punk influences. The vocals are very harsh, but tolerable. The drumming is programmed and inhumanly fast, but at the same time enjoyable. The guitar work is the real story here though. Guitar work is where a lot of grindcore bands falter, but this band does it right. The last 7 tracks are done by Eternal Mystery. Eternal Mystery has made a few alterations to their sound over the years. This is actually the first album with their last "new" vocalist. You'll be greeted with some fairly comprehensible vocals, both high range and low range (but no pig squeals and no DEEP gutturals). Try your best to pick this little one up from Divine Metal Distro or Download it From iTunes. You won't be disappointed. NOTE: Not for metalcore fans. There are absolutely NO breakdowns (which is how grindcore was intended to be).